The announcement said that today was going to be a big day in VMware history. So I fired up VMware NOW and attended the General session of VMworld 2012 which started today in San Francisco. Before the first keynote starts the General session was opened with a spectacular show with dancers and music, etc. VMUG members in the audience. After this Paul Maritz gets on stage for his presentation on the IT Transformation as the Enabler of Business Transformation. Paul starts with the changes in IT which we are facing now and he defines the drivers of change. 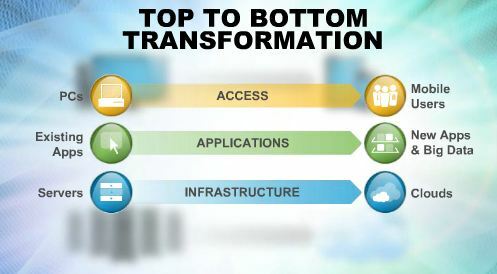 It is a top to bottom transformation,starting with infrastructure, through applications to the access layer. Paul explains that virtualized workloads have expanded from 25% of Intel servers in 2008 to 60% of servers now. He states that we are very far along on a 50 year journey to automate paper-based information. But in the comming year the transformation will be as ground breaking as the 50 years before. Three transformations are taking place now. 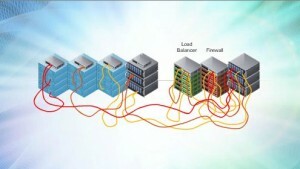 First, physical servers moving to virtual to cloud. 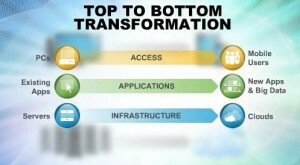 Second, shifting from existing applications to new apps and big data. And third, there is a shift from PCs to a mobile dominated, multi-device world that redefines how users access information. Next up Paul introduces Pat Gelsinger, who will be leading VMware into the next years of innovation in IT. According to Paul Pat is not a person who is layed back, “so enjoy the ride with Pat”. As Paul leaves the stage he gets a received standing ovation from all the attendees. Pat Gelsinger starts with saying that he is no stranger to VMware and has known and followed the company for a long time. He has been a big VMware enthusiast from the beginning, knowing Mendell Rosenblum and experiencing the first vMotion. 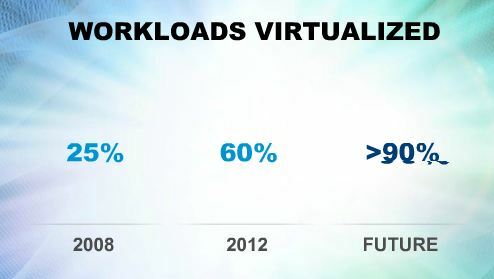 According to Pat, as of this year 60% of all workloads are virtualized. Our combined goal is getting the workloads virtualized up to 90%, so that un-virtualized system are an exception. 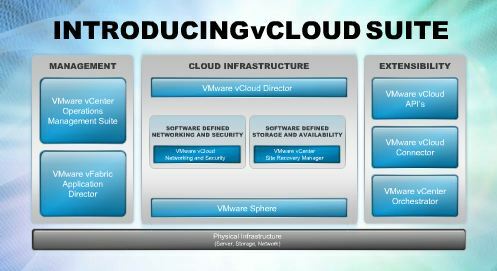 The way to achieve this, is by the use of a totally software defined datacenter, the VMware vCloud Suite. vCloud Suite is unmatched for delivering such data centers. Pat introduces the vCloud Suite, unmatched in the industry, with the highest performance with vSphere 5.1 which will also be introduced today. Next up is a announcement which is welcomed with a standing ovation. VMware conducted many customer surveys and one thing that returned was the VMware vRAM licensing model. So VMware listened to its customers and discontinues the controversial, one year old, vRAM licensing model and returns to the previous processor based licensing model. 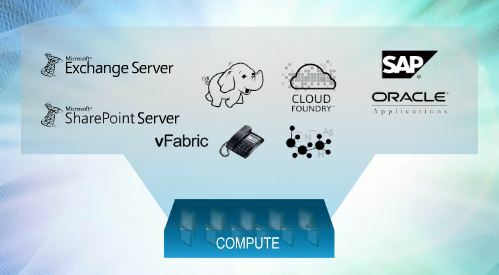 Pat’s last statement is that he sees Cloud Foundry, DynamicOps and Nicira as core to the software defined data center, which also vowed to keep VMware open to supporting multi-cloud environments today and into the future. Next up, Pat introduces VMware’s Chief Technology Officer, Steve Herrod. Steve calls on channel partners to more and more virtualize mission critical apps like SharePoint, Exchange, SAP and Oracle. After this Steve focuses on the elephant in the figure on screen. This refers to project Project Serengeti which uses Apache Hadoop Big Data on VMware. Steve calls to keep an eye on Project Serengeti. Next up Steve focuses on VMware vSphere 5.1 and introduces a few new features to take the wind out of Microsoft’s sails. First, storage availability. 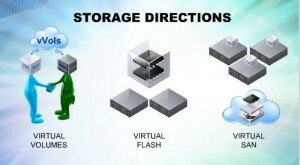 VMware set a new standard with the software defined storage features which vSphere 5 delivers. Now with vSphere 5.1, VMware takes this a step further. Much like ‘Share nothing Live migration’, VMware vSphere can now vMotion workloads without the need for shared storage. 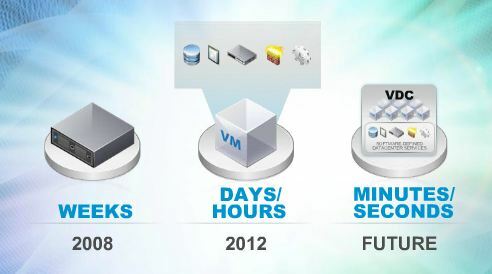 VMware calls this Enhanced vMotion. This makes VMware vSphere 5.1 especially interesting for smaller businesses. The other new storage features in vSphere 5.1 are vVolumes (vVol), virtual Flash and virtual SAN. The last item Steve touches before some nice demos is, networking. Networking is a virtual environment has lagged behind in many ways but now with the shift to the cloud it is necessary to get the networking part at the same level. Especially with the new vCloud Director Suite, networking will become more and more important. VMware recently acquired Nicira and with VMware’s brought vXLAN ecosystem this should bring the networking part up to speed. Want to become VCP on VMware vSphere 4?